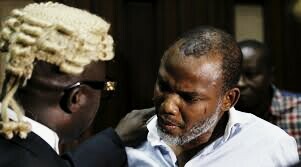 The trial of the leader of the Indigenous People of Biafra (IPOB), Nnamdi Kanu, has been adjourned till December 5, with the court insisting that the defendant’s sureties either produce him or explain his disappearance to the court, Premium Times. The Abuja Division of Federal High Court, presided over by judge, Binta Nyako, had in October adjourned the matter till Monday (today), in expectation of the appearance of the sureties. She had further given instructions that the sureties had three options regarding their roles in the disappearance of Mr. Kanu. 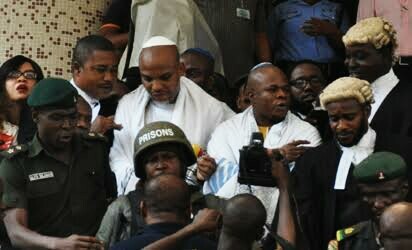 Reacting to an application by one of the sureties, Eyinnaya Abaribe, through his lawyer, Ogechi Ogbonna, that he should be relieved of his role as Kanu’s surety and that the court withdraws its order for a bond of N100 million, Mrs. Nyako noted that only the appearance of the defendant would prevent a possible forfeiture of the bond. “Even if you apply from today till next year, this court will only have one of these three options for you: produce the defendant, pay the bond or demand for time to come and explain to court,” she said. ”Once you sign to be somebody’s surety, that person automatically becomes your responsibility,” Mrs. Nyako said. Kanu was last seen on September 14, months after he was granted conditional bail specifically on April 25 based on health grounds. His lawyer, Ifeanyi Ejiofor, accused the Nigerian Army of invading Kanu’s residence in Abia State and kidnapping him (Kanu).  The allegation was however denied by military spokesperson, John Enenche. “It’s simple what the court can do is to declare him wanted. I don’t think the court can do anything more than what it has mentioned in its conditions to the sureties,” he said. On Monday, however the court shifted the date for its hearing of the sureties’ explanations till December, following the current engagement of judges at a conference in Abuja. Kanu’s sureties are: Eyinnaya Abaribe, a Jewish priest, Immanuu-El Shalom, and an accountant and Abuja resident, Tochukwu Uchendu. From left in front row, David Nwawuisi dressed in white with Benjamin Madubugwu, sitting next to him and two other lawyers: while Chidebere Onwudiewe wears a white stripes native attire, behind the two co-defendants. He is facing trial along side three others: Benjamin Madubugwu, David Nwawuisi, Chidebere Onwudiewe.